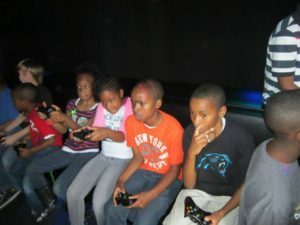 The Ultimate Mobile Video Game Party in Houston, Texas! 7 High-Definition Video Gaming Centers! 28 can play at once! With 7 Hi-Def TV’s, up to 28 guests can play at once! It’s the Ultimate Houston Video Game Party!! From MarioKart to Minecraft, from Madden to Call of Duty, we’ve got the greatest video games! 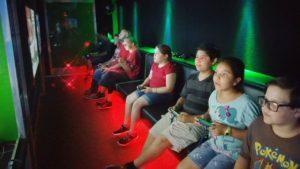 We are the NEWEST, BIGGEST, most HIGH-TECH Game Theater in the Houston area! Houston’s BEST and newest video game truck ROCKS! It’s a new game, Houston! 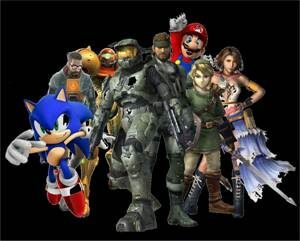 Infinite Gaming brings the newest, most exciting mobile video game theater right to you! 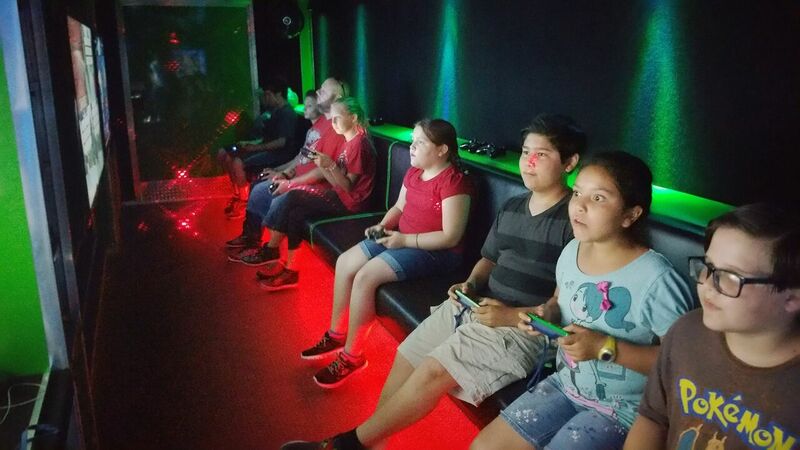 Our brand new, HUGE 32 foot gaming theater features 7 awesome gaming stations…5 inside and 2 more outside.. allowing up to 28 guests to play at one time! With stadium-style tiered seating, higher ceilings, full climate control, laser and neon lighting and more, there is no comparison to the Infinite Gaming mobile video game trailer! We have 7 High-Def TV’s! 28 can play at once! 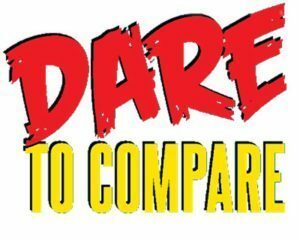 Compare that to the competition…nobody else comes close! We have just added KARAOKE to our entertainment package! You and your guests can sing along to any of your favorite songs or tunes. Our professional grade microphones and 180 watt sound system are sure to provide hours of entertainment at your party. We have everything you need to sing the latest hits like a Superstar! Maybe you just want to Bluetooth your phone and play music… we can do that too! Let us know how we can make your party a success. Stadium Seating and Climate Control! Birthday parties, school events, church fairs, festivals, fundraisers, civic and city events, parades and carnivals…even the best Tailgate Party…we bring the best mobile entertainment venue right to you! We’re completely self-powered by our own quiet generator…we can go almost anywhere…whether the party’s in your driveway, at your curb, at a park, a church, an outdoor fair or festival, Infinite Gaming is the go-anywhere party that comes to you! Houston’s BEST Party Idea comes right to you! Our Game Coach instructs players and runs the party while you relax…and your home stays clean! It doesn’t get any easier…or any more fun! No more boring bowling or pizza parties! 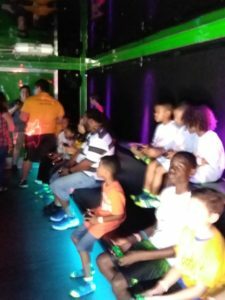 No transporting a dozen kids to the local arcade or laser tag center…we have the BEST party idea in Houston, and we bring it to you! Don’t settle for less… BOOK THE BEST!